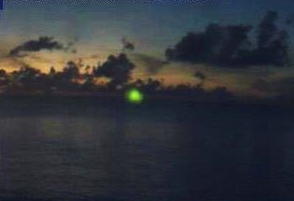 A green flash occurs when the conditions are right as the sun rises or sets. Growing up on St. Croix with many weekends spent at the beach at the west end of the island, I’ve seen a few of them. As I sit down to get some work done on this damp, dark, dreary, rainy day Monday I think about this one to two second flash of brilliance on the horizon. Sometimes it is just what you need to refocus your attention on the task or project at hand. So, what then is the equivalent of a green flash moment on a project. It’s that thought, idea or component that drives you forward. It could be the group of people you are working with; or the ability to use a specific skill; or learn something new. It doesn’t really matter what it is, but rather that it motivates you. And this is a more personal endeavor than just being on time, or on budget, or meeting a specific stakeholder KPI. This can and probably should be different across different projects. Just like a lighthouse beacon, every decision or action you take should be with this point in mind. This means that you need to consciously think through your actions to make sure they align to this particular project goal. While I don’t necessarily think it’s necessary to share your personal green flash moment, but I do think that you need to visualize yourself succeeding in the way you defined. Your mental conversation should be how you get to the end, not questioning whether you can get there.